[New for 2013] Last Wednesday was quite the day for me. 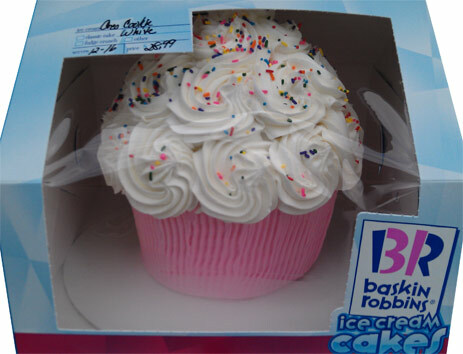 The low points included discovering that I had melted the electrodes off one of my spark plugs while the high points included Baskin-Robbins sponsoring a trip to their store to pick up their new Too Cute Cupcake Cake. Yeah, just another day in the life of a daddy blogger. The car is rolling again with new plugs, so let's dive into my dinner I mean the cake. that is sure to make any birthday more fabulous"
Ok, so remember how I took my daughter out for our first trip to Baskin-Robbins, and remember how I said I nudged her into trying the OREO 'N Chocolate ice cream that she didn't really like? Well, the awesome folks at BR felt bad and offered to make it up to her. Now I do this for a (fake) living and even I was shocked at their generosity. I gave them a big thanks and we decided to let my daughter choose the cake. 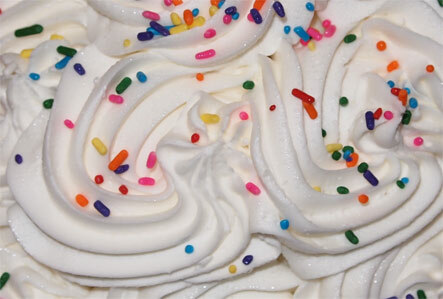 See, you can have either white or chocolate cake, and then you can pick one of several flavors for the ice cream filling (I'm not sure if you can use any flavor, but I don't be afraid to ask). My daughter went with the white cake and OREO Cookies 'n Cream ice cream. Mmmm, sounds like a winner to me! Plus, they even made it pink for her (it also comes in blue). If you want to see all the options, check out this webpage. 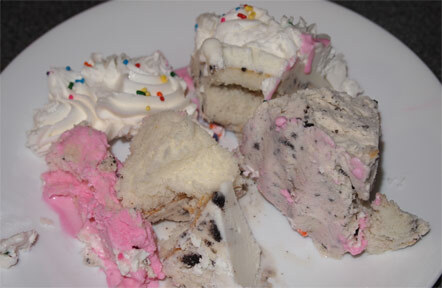 Oh, and if you are in a hurry, they had a couple of pre-made cakes ready and waiting in the freezer by the door. Alright, let's break this down piece by piece. The top of the cake is covered in a a solid whip cream/frosting that is very sweet. It kind of reminds me of a buttercream mint in that it's soft yet solid. My wife said she preferred this frosting. 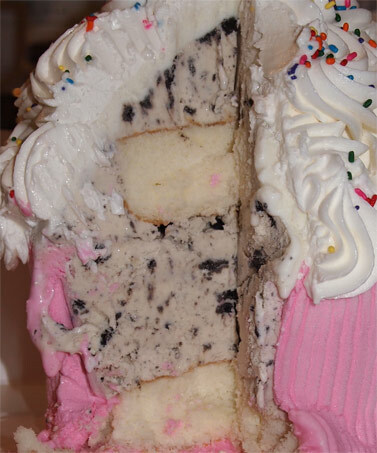 The bottom of the cake seems to use a mild flavored soft ice cream of some sort to represent the cupcake wrapper. While I enjoyed the top frosting, both my daughter and I thought this pink frosting was more to our liking. It's soft, fun to scoop off the plate and has a nice mild sweetness to it. though I don't think this photo really captures the fun of this cake. typical cake results: first serving fail! I will admit that it was a bit of a handful to cut up , but that extra work will be paid off by the smiles of your guests going "that's so cool!". 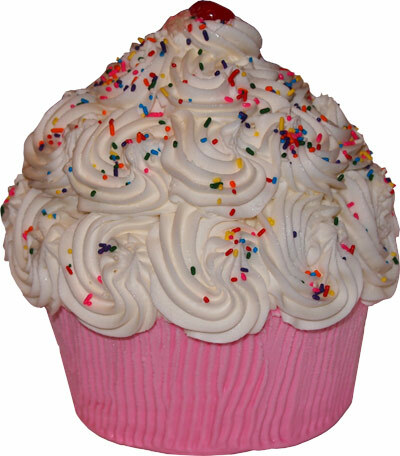 How can you not love a giant cupcake made out of cake and ice cream? You can't. Baskin-Robbins makes excellent cookies 'n cream ice cream and now it's wrapped in an adorable shell. It's a win-win. Now the cake was priced at $28.99 and it says it serves 12-16 people. I was a little skeptical of this at first, I thought maybe the cake looked a little small for that size crowd, but after quickly filling up on the rich ice cream and dense cake, I could see this feeding a lot of people. In fact, I'd almost be half tempted to show everyone the cake, then sneak it off to another room, separate the top half from the bottom half, and then divvy it up that way. Maybe give the kids the frosted top half and the adults the tamer bottom half. It's just a thought, and no matter how you serve it, people will like it.